Diabetic retinopathy is the change that occurs in the blood vessels in the retina due to the abnormal blood sugar levels and other factors associated with diabetes mellitus. The retina is the light-sensitive tissue at the back of the eye that actually receives the light rays. Some of the small blood vessels, the capillaries, can become closed off. The retinal vessels can also leak fluid into the retina. Both the closure and the leakage can reduce vision. Blurred vision is usually the first symptom of diabetic retinopathy. However, fairly advanced diabetic changes can occur with normal vision. This is why regular eye examinations are important for patients with diabetes. An ophthalmologist skilled at retinal exams can detect diabetic retinopathy. Fluorescein angiography, a series of photographs taken after injection of a dye, can help to pinpoint areas of leakage and blood vessel closure. Optical coherence tomography (OCT) scans using light rays can detect leakage, scar tissue, and traction on the retina. 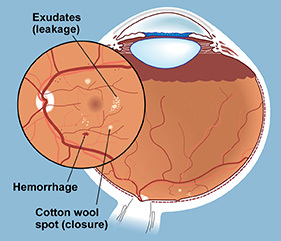 If there is significant leakage of fluid in the macula, the center of the retina responsible for fine, reading vision, injection of medications to reduce leakage, or laser treatment may be recommended. Sometimes the vision is improved after these treatments, but sometimes the vision is only stabilized. Studies have shown that diabetic complications, including eye problems, can be minimized by keeping the blood sugar and blood pressure as close to normal as possible.